My favorite truck stopped by my house yesterday. I love the UPS man. Who's not happy to see the UPS man/woman? They bring presents, never bills. Yesterday he brought me this. It's my Blog Book/Family Album that I finished last week. Here's the cover. Isn't it pretty? I'm so excited! Originally the plan was to slurp my blog on Blurb, but they no longer slurp Blogger blogs. Bummer. However, my resourceful friend, Janet, has managed to copy and paste her Blogger blog into a Blurb book and is on the verge of ordering it. I asked her about the process, and she said that she was very happy with the number of templates available for her to use. And even if she could have slurped her blog, she probably would have been moving things around anyway because she wanted her captions to stay with their respective pictures. And she was able to do that in Blurb. It's all about control. My friend. So, I'm anxious to see her book once she gets it. I went another route though. I ended up copying and pasting my blog into my Creative Memories StoryBook Creator Plus program and turning it into a 12x12 StoryBook. Somewhere in the whole exhausting process, I decided to include my digi scrap layouts in their respective chronological order amongst my blog posts, and a huge mountain of responsibility lifted from my shoulders. You see, I rationalized, if I've included some of my family pictures in a blog post already, I don't have to digi scrap said photos as well. Ding! I just killed two birds with one stone. The only time I included the post with a digi scrap layout of the same pics was when I wanted to keep the story from the blog post with the pictures. I'm not always very good at including the entire story with my digi scrap layouts because that leaves less room for embellishments. Pretties. I'm very happy with the result. I kept the blog post pages very simple and white, and just copied and plunked my posts right into the book. With StoryBook Creator Plus, I not only had complete control over the placement of my pictures, but control over the number and size of pictures on a page. Ditto with the font choice, size, color and drop shadow. I could have put pretty paper for a background, but I didn't even want to open that can of worms. I wanted to get it done fast. I'm very happy with the digi scrap layouts. They came out vibrant and gorgeous. This book is going to fit nicely on my bookshelf. It will take up much less room than a scrapbook album for the same time period. I love that. But, since I'm not the type to simply blow sunshine, here are the negatives. 1) The maximum number of pages that can go into a Creative Memories Storybook is 100, which is really 50 actual pages, 100 only if you're counting the front and back of the pages. For me, since I'm such a wind bag, that meant that my book includes only January through September of 2008 instead of the entire year as I would have liked. 2) You need a software program to be able to do this. You could do it with the StoryBook Creator Plus program and order the book from the Creative Memories Photo Center, or you could do it in PhotoShop Elements or some other digi scrap program and order it from Shutterfly. 3) My book, with shipping and sales tax included, was $261.35. I know! You think you're surprised, I'm still recovering from my heart palpitations. However, I'm good at rationalizing when it suits me, and I know I would have spent more money and time trying to put all this into a scrapbook album at home, and it would have taken up much more space. I'm so happy with the results that I'm not even going to complain about the cost. And its ensuing financial crisis. Did I mention that denial is my friend too? OMG! That is expensive... but true, some of my scrapbooks end up around $400 with about 80 pages (both sides) and 4" wide. It looks great and I am *actually* considering it... You are a great sales woman! Looks great! Can't wait to get mine done! I think because I never calculated just how much a scrapbook page costs, that sounds expensive, but I bet some of my pages are pricey, if I calculated, and didn't buy things on sale, etc. It looks great and now you have a record of all those different blog entries and header designs, too! Cool! P.s...yes he's a REAL rocket scientist. He works in the missile defense area! hoe very interesting. you can turn your blog into a book?! definitely checking that out. How cool to turn your blog into a book!!! That is just neat! It turned out AMAZING. I think I am getting close to starting in on my own...but oh the work I have ahead of me!!! Thanks for all the info! Wow! That price tag just gave me heart palpitations! And I was kind of freaking at the place I found to slurp my blog for $80. Guess it's a deal now. But seriously, this is such a cool idea. I need you to give me some specifics on how you moved everything over. So cool that you added some of the scrap pages. So, so cool! It looks great! A little expensive but great. Lee Anne, It was just a matter of having two windows open, one for my blog and the other for the scrapbooking program. Then I would copy what I wanted from my blog and then paste it into my program. It was pretty easy, but time consuming. Wow, that is a great book. I love the term slurp, it's making me giggle. What a great keepsake to share with your girls when they grow up. It's totally worth the cost. 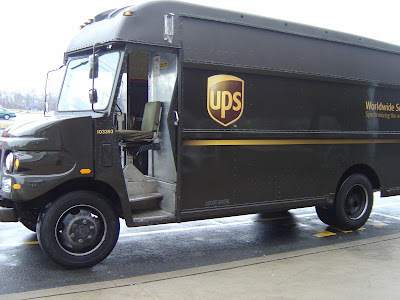 Oh yes, Maddy spots every single UPS truck and yells, "Package guy!" Someone revive me please. I've been wanting to do that for ages because I have a fear of my blog disappearing someday and I want the memories for me boys. That price did choke me though. It turned out incredible and I do love how it takes us so little space, I have way too many albums at my house. Wow, it looks great! Love the quality of the pages/pics, beautiful! But $261.35??? wow, that's a little expensive! Let us know how your friend's turns out. Jill, it looks fantastic! I loved it. I might still be convinced to do it that way because I have tried several times to download it and I get errors half way through. I started reading through the forums and found that it may be cheap but there are a lot, I mean a lot of problems, that people have had with Blurb. I may have wasted two weeks of my life. Yikes! I'll keep you posted. It looks great, probably a little more than I could spend but I LOVE how it turned out! Thank you for the info on Blurb, that was what I was thinking of doing so I'll wait to see how your friends turns out. Way to be an achiever too, it's only the end of January and look what you have already, a COMPLETED book. Not to mention your little girls' Valentines are so cute and it is not even February 13 yet and they are ready! Jill. Love the Idea for the "blog book". I have a question for you about the Story book software you use. Could I set the layouts to music on a DVD? for a Christmas present? Thinking of replacing my Christmas letter if it would work. I have questions!!! I have also created a story book with creative memories and love them...not that expensive, but i totally understand it.....how do you get your blog page into the software? I'm new with the plus software, so please let me in on your secret!! What cracked me up is the picture of the UPS truck. I can imagine what the driver was thinking! The book is GORGEOUS although I think paying that woul give me a heart attack. THAT is amazing!!! I absolutley LOVE LOVE LOVE the idea! I have not purchased storybook creator yet...but after seeing that masterpiece...I am totally going to get it! WOW! Can I come live with you? I dont take up much space. I love to eat and scrapbook so it would be perfect! Pleeeeeeese!!!!! I got to see some of the CM 12x12 pages and on of there books at a crop I attended this past month and was so impressed. The printing and quality was wonderful. I came home and signed up to be a consultant and downloaded the free sample software but I am having a little trouble figuring it all out. I have always used Photoshop CS3 and know how it works but switching to CM I can not figure out things like turning the page into a Jpeg or bringing over papers I have downloaded. I plan to ask my CM Rep next time we crop. Maybe it will all work once I buy the full version, I just want to be sure.